From the mountain peaks of the Apennines to the Tuscan Maremma, from the Via Francigena to the Renaissance ring of Florence, Tuscany offers itineraries for all kinds of trekkers A lot of paths are set up by the CAI (Club Alpino Italiano, that means Italian Alpine Club) and you can recognize them from the red and white stripes with an identification number. There are also many circuits in different areas of Tuscany that include several stages so you can choose the section you want to cover. Whether you are looking for a challenging path or an easy walk, here are some tips to help you choosing the itinerary that suits you best. The longest trekking route in Tuscany is called the Grande Escursione Appenninica (GEA). It is about 400 kilometers long and it crosses the mountain ridges of the Tuscan – Emilian Apennines, from Bocca d’Abria (Umbria) to La Spezia (Liguria). It is divided into 22-27 stages (with a refuge for food and assistance at the end of each stage). Find out here a map with all the paths on the Apuan Alps. If you want more than a mountain walk, Tuscany’s Apuan Alps offer interesting vie ferrate - protected climbing routes equipped with fixed cables, steeples, ladders, and bridges. Enjoy the thrill of walking on a mountain crest or climbing different types of rock faces. Check out more info about Vie Ferrate in Tuscany here. The Via Francigena is an ancient road running from France – hence the name “Francigena” – to Rome in Italy, although Canterbury in England is considered the main starting point, much further away from France. The Via Francigena passes through England, France, Switzerland and Italy, 400 kilometers (250 miles) of which are in Tuscany. Find out here the most important information about the 16 legs of the Via Francigena. You can choose a single leg or the entire Tuscan path. The route Via degli Dei (literally the route of Gods) connects Bologna to Florence, retracing an ancient historic road used since Roman times to join the towns of Felsina (Bologna) with Fiesole (Florence). Named also “Military Flaminia,” the Via degli Dei is a 130 kilometres route characterised by paved roads passing through the Apennines. Extending for more than 350 kilometres through the Northern and Central Apennine mountains, the Cammino di francesco stretches across the Italian regions of Tuscany, Umbria and Lazio and can be explored both on foot and by bike. If you are looking for a trekking path not far from Florence you must take the Renaissance Ring (Anello del Rinascimento), a 170 kilometers long route divided into 13 stages. It is ideal for walking or mountain biking and each section of the Ring has a public transport link with Florence, so you can also choose to cover just one portion. You will come across monasteries, castles, hospices to welcome pilgrims, ancient walled communities, country churches and sections of paved roads that go back to Roman or Medieval times. Florence Tourism office has created a map-guide that describes the following 13 Renaissance Ring steps: Calenzano-Vaglia; Vaglia – Alberaccio – Fiesole; Impruneta – La Certosa; La Certosa- Firenze; Certosa Signa; Signa – Campi Bisenzio – Calenzano; Pontassieve – Montecucco – S. Donato; San Donato in Collina – Impruneta; Rignano sull’Arno – Montecucco – Bagno a Ripoli ; Vaglia – Alberaccio – Santa Brigida; Santa Brigida Pontassieve; Signa – Firenze. For getting a map-guide write or call: +39 05523320, apt@firenzeturismo.it or download the description of each stage here. Another ring route not far from Florence is the SOFT, acronym for Sorgenti di Firenze Trekking (Florence Springs Walking), a system of hiking trails with other twenty-two secondary trails in the Mugello valley, along the Florentine Apennines. Along the ring there are many accommodations in villas, farmhouses, monasteries and so on. 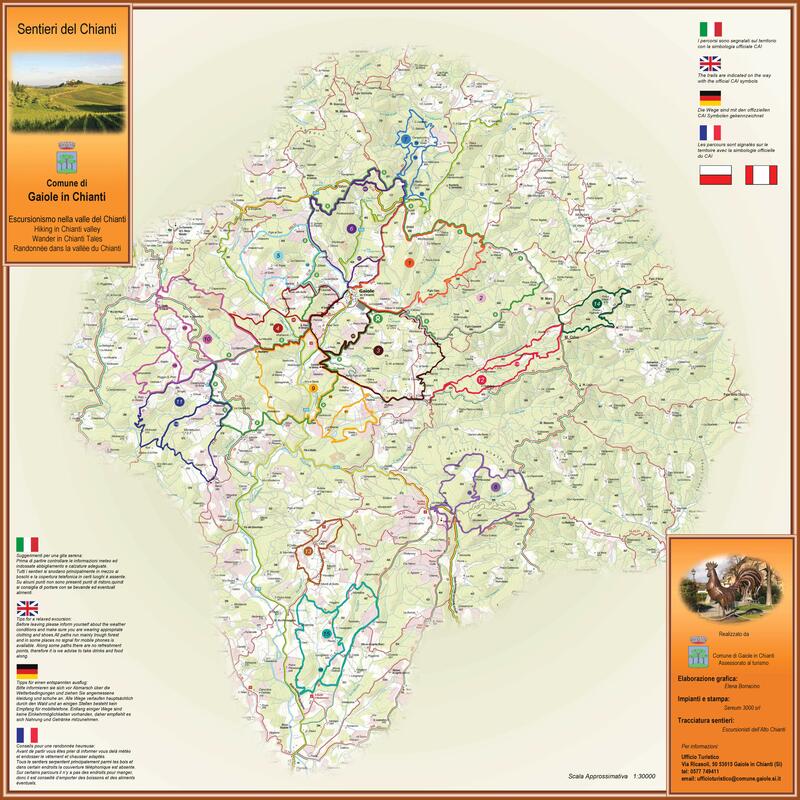 Would you like to walk the soft hills of the Chianti area? Explore Gaiole in Chianti on foot or by bike. The already extensive network of hiking trails was recently renovated and newly marked. You can now choose among 15 different routes, which will make you discover the castles, the hamlets, the vineyards and the surroundings of Gaiole at their best. Click here to download the general map of the trails. Vetta Mare is a path of 151 kilometers divided into seven stages, which runs through some of the most beautiful places of the Maremma from Mount Amiata to Porto Ercole. The routes are approximately 15-20 kilometers each, the path is clearly marked and suitable on foot or by bicycle. From April 21 to May 1 you can join one (or more) guided excursions organized by Manciano municipality as part of the Top Secret Maremma activities. Info here. On Elba Island, take the Great Elba Crossing, a roughly 60km excursion route that cuts across the island from east to west. If you have limited time, simply reach the Monte Capanne summit from Marciana Marina in 2 to 3 hours. In spring and autumn join the Walking Festival island excursions in Pianosa, Giannutri, Elba, Giglio and Capraia. Participation is free, but booking is mandatory. Have you ever been hiking in Tuscany? Which is your favourite trekking trail? Tell us in the comments!